Experimental design of the VSD imaging experiment. A, IAN (arrows) in the right mandibular bone was exposed (a) and transected (b) in a model that received IANX. In the photographs, a black silk thread was placed under the IAN to clearly show the IAN. B, To stimulate the molar pulps, enamel-coated copper wire electrodes were inserted into the maxillary and mandibular 1st molar pulps. C, A schematic drawing of the in vivo preparation for the optical imaging of the somatosensory and insular cortices. D, Position of the stimulation electrodes (maxillary and mandibular 1st molars). E, Schedule of operation and VSD imaging. The sham operations or IANXs were performed at postnatal weeks 5–6. In the sham groups, VSD imaging was performed one week (1w-sham) or four weeks (4w-sham) after the sham operation. In the IANX models, the VSD imaging was performed one week (1w-IANX), two weeks (2w-IANX), or four weeks (4w-IANX) after IANX. 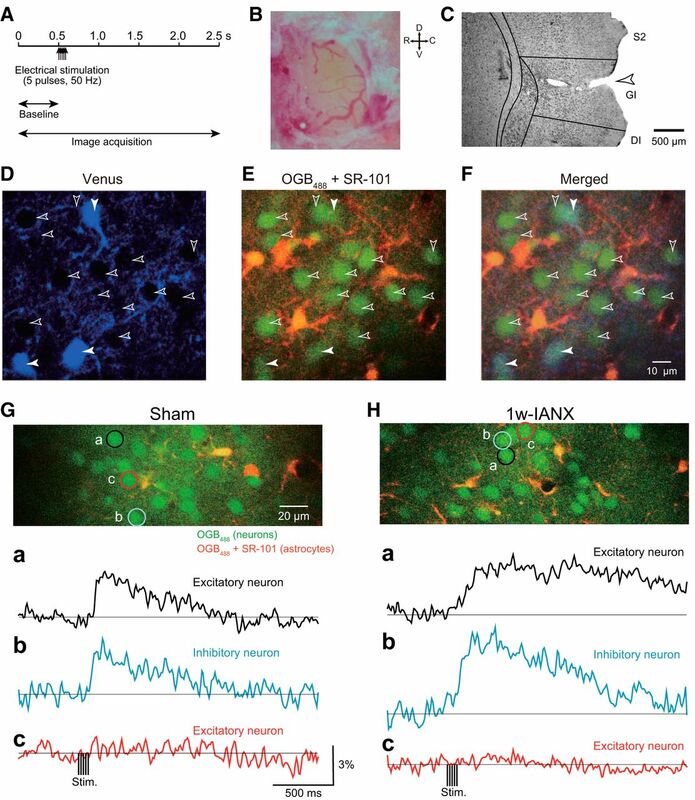 IANX transiently decreased the cortical responses to the mandibular molar pulp stimulation. A, Examples of cortical responses evoked by the electrical stimulation of the mandibular molar pulp in the Sham (1w-sham and 4w-sham) and IANX (1w-IANX, 2w-IANX, and 4w-IANX) groups. The time from the onset of the electrical stimulation is shown on the top of each panel. R, rostral; C, caudal; D, dorsal; V, ventral. B, Temporal profiles of optical signals in the ROIs (white circles) in S2/IOR shown in A. Arrows indicate the timing of the electrical stimulation. C, Comparison of the peak amplitude, latency, and time to peak of optical signals in response to electrical stimulation of the mandibular molar pulp. The numbers of animals are shown in parenthesis. Note that the latency and time to peak were estimated in cases in which significant optical signals were obtained. There was no significant difference between 1w-sham and 4w-sham groups (n.s. ; Mann–Whitney U test). D, Superimposed images of the maximum responses evoked by the mandibular molar pulp stimulation. The number of overlapping responses is represented by gradation of the color density. The line outlines the area responding to stimulation in 50% of animals. RF, rhinal fissure. E, Comparison of areas activated by the stimulation. Note the significant decrease in the excitation area in the 1w-IANX group (Mann–Whitney U test). F, Comparison of the excitation area shown in D. Solid and dashed lines indicate the responding area in 50% of the animals of the IANX model and sham groups, respectively. Note that the only outlines of the sham group are shown in the left panel because of no superimposed area in 50% rats of 1w-IANX group; **p < 0.01, ***p < 0.001, Mann–Whitney U test. 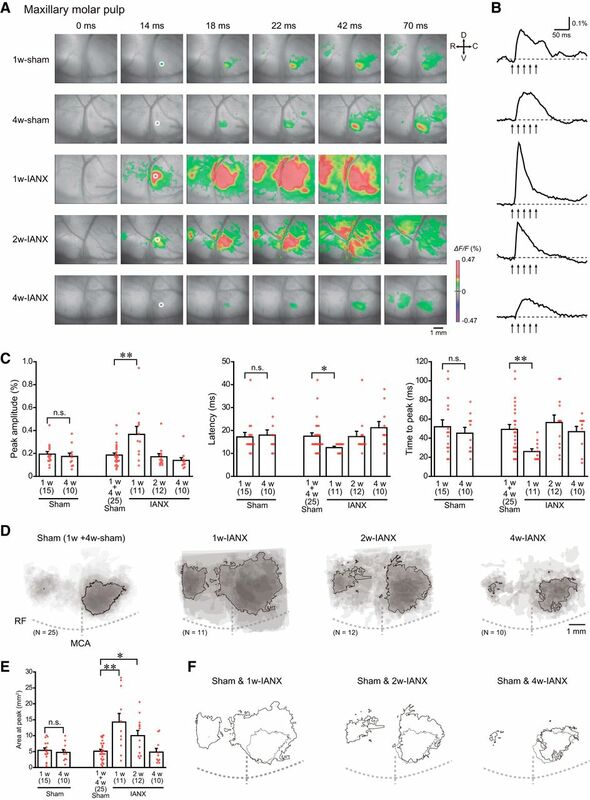 IANX transiently increased cortical responses to maxillary molar pulp stimulation. A, Examples of cortical responses evoked by electrical stimulation of the maxillary molar pulp in the sham (1w-sham and 4w-sham) and IANX model (1w-IANX, 2w-IANX, and 4w-IANX) groups. The time from the onset of the electrical stimulation is shown at the top of each panel. B, Temporal profiles of optical signals in ROIs (white circles) in S2/IOR shown in A. C, Comparison of the peak amplitude, latency, and time to peak of optical signals responding to the stimulation. The numbers of animals are shown in parenthesis. Note that there was no significant difference between the 1w-sham and 4w-sham groups (Student’s t test or Mann–Whitney U test). D, Superimposed images of the maximum responses evoked by the maxillary molar pulp stimulation. The number of overlapping responses is represented by the gradation of the colors. The line outlines the area responding to stimulation in 50% of animals. E, Comparison of areas activated by the stimulation. Note the significant increases in the excitation area in the 1w-IANX and 2w-IANX groups (Mann–Whitney U test). F, Comparison of the excitation area shown in D. Solid and dashed lines indicate the responding area in 50% of the animals in the IANX model and sham groups, respectively. Note that the activated area expanded primarily dorsally in the 1w-IANX and 2w-IANX groups; *p ≤ 0.017, **p < 0.01, Mann–Whitney U test. Ca2+ imaging by two-photon microscopy. A, Stimulation and image acquisition protocol used for the Ca2+ imaging. B, An example of craniotomy in S2/IOR. The diameter was 0.5–1.0 mm. C, An example of a recorded region. After the Ca2+ imaging, the recorded region was marked by penetration with a heated needle. Note that the location of the recorded region was set around the border between S2 and IC. D, An example of imaged fluorescence of Venus. Before the injection of a mixture of OGB488, which is a Ca2+ indicator, and SR-101, which is an astrocyte marker, the distribution of Venus-positive neurons in VGAT-Venus rats was systematically imaged (excitation wavelength = 950 nm). Green fluorescence was artificially recolored to blue in this figure. E, An example of imaged florescence of OGB488 and SR-101 (excitation wavelength = 800 nm). Note that the neurons exhibited green fluorescence only, and glial cells exhibited both green and red fluorescence. F, Post hoc identification using merged image of Venus (D) and OGB488/SR-101 (E). Note that the open and filled arrowheads indicate Venus-negative (non-GABAergic; excitatory) and Venus-positive (GABAergic; inhibitory) neurons, respectively. G, An example of Ca2+ responses to electrical stimulation of the maxillary molar pulp in a sham rat. The imaged area is shown in the top panel. The circles (a, b, c) indicate the ROIs. Traces of Ca2+ signals in the responding excitatory (a) and inhibitory (b) neurons and a nonresponding excitatory neuron (c) are shown in the lower panels. H, An example of Ca2+ responses to electrical stimulation of the maxillary molar pulp in an IANX rat. IANX was performed one week before the Ca2+ imaging. The imaged area is shown in the top panel. Temporal changes in Ca2+ signals in responding excitatory (a) and inhibitory (b) neurons and a nonresponding excitatory neuron (c) are shown in the lower panels. 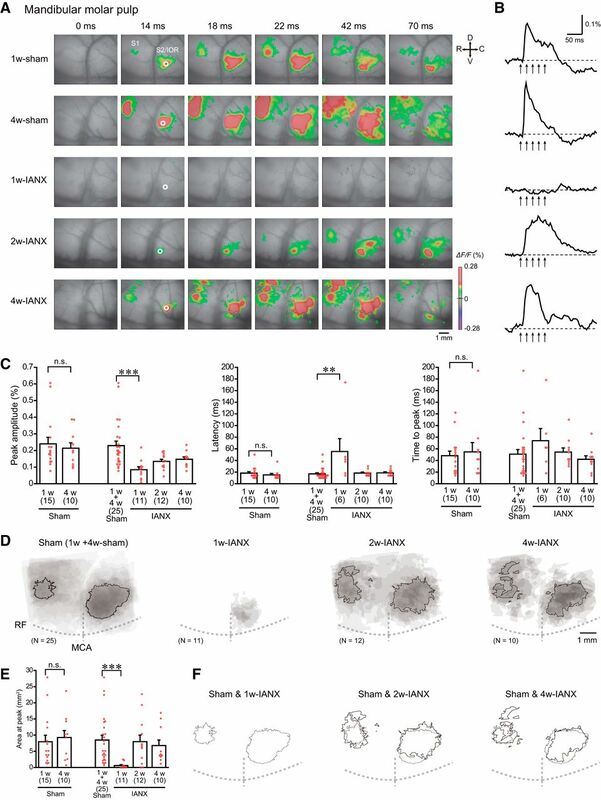 Note that the Ca2+ responses in the responding neurons in the IANX rat were long lasting compared to those in the sham rat. DI, dysgranular IC; GI, granular IC. Ca2+ responses to maxillary molar pulp stimulation obtained from sham (N = 14) and 1w-IANX (N = 11) rats. A, Cumulative curves of the peak amplitude in excitatory and inhibitory neurons. Note that the number of neurons showing a high peak amplitude increased in both types of neurons in the IANX rats; ***p < 0.001, Kolmogorov–Smirnov test. B, Rates of responding neurons. The number of neurons is shown in the columns; ***p < 0.001, χ2 test. C–F, Time to peak (C), latency (D), 20–80% rise time (E), and duration above 2 SD (F) are shown; *p < 0.05, **p < 0.01, ***p < 0.001, Mann–Whitney U test. LSPS in the presence of 200 µM caged-glutamate. A, A representative confocal image of a Layer V pyramidal neuron visualized with Alexa Flour 594. UV laser photostimulation sites are indicated by blue circles (10-µm interval). B, Voltage responses evoked by direct photostimulation (5-ns duration, four pulses at 5 kHz) onto the soma shown in A following the application of HDC ACSF containing 200 µM caged-glutamate. Time-expanded traces are shown in the bottom panel. The intensity of LSPS was 1.0 mW (a), 2.3 mW (b), and 4.6 mW (c). Note that depolarization is intensity dependent, and 4.6-mW LSPS evoked a single action potential. 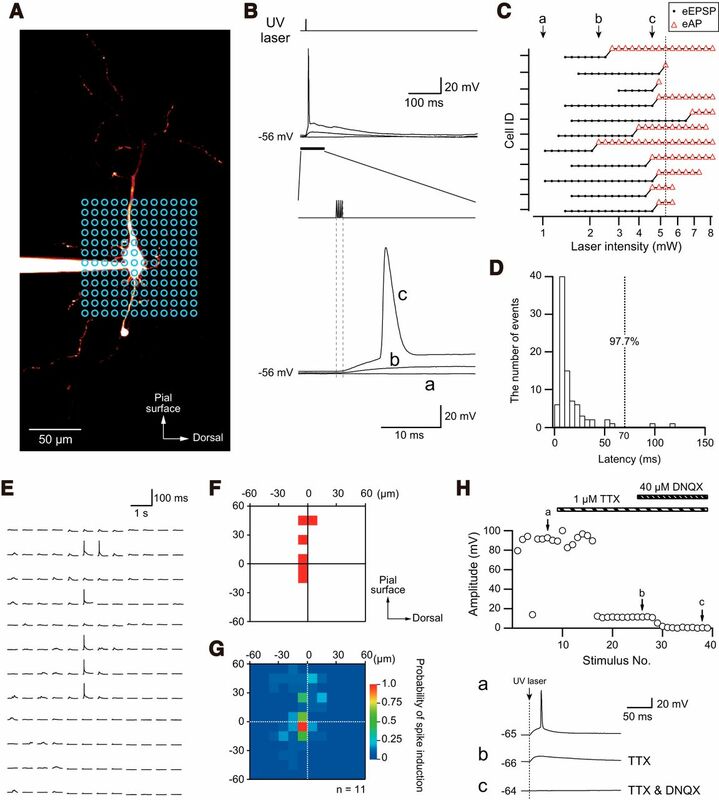 C, LSPS intensity-dependent action potential induction in 11 pyramidal neurons from nine rats. Application of LSPS at 5.1 mW to the soma of pyramidal neurons invariably evoked action potentials (eAP). Induction of EPSPs without action potentials is shown by dots (eEPSP). The top neuron is shown in A, B. Traces of a, b, c in B are indicated by arrows in C. D, A histogram of the latency of LSPS (5.1 mA)-induced action potentials in pyramidal neurons (n = 13). Within 70 ms of the onset of LSPS, 97.7% of pyramidal neurons evoked action potentials. E, F, Voltage responses to LSPS to each circle (E) and hot map of LSPS-induced action potentials (F, red pixels) in the same neuron shown in A, B. G, A color-coded map showing the probability of action potential induction in 11 pyramidal neurons. Note that the high probability at the soma contradicts the low probability at the distal dendrites. The origin of the coordinates indicates the center of the soma. H, Effects of 1 μM TTX and 40 μM DNQX on evoked responses by LSPS. Action potentials were blocked by TTX, and the residual depolarizing potential was completely diminished by DNQX. Representative examples of excitation maps of Layer II/III pyramidal and fast-spiking neurons obtained by LSPS. A, Translucent image of an IC slice with two patch electrodes attached to pyramidal and fast-spiking neurons. LSPS sites (open circles; 62.5-µm interval) are superimposed. 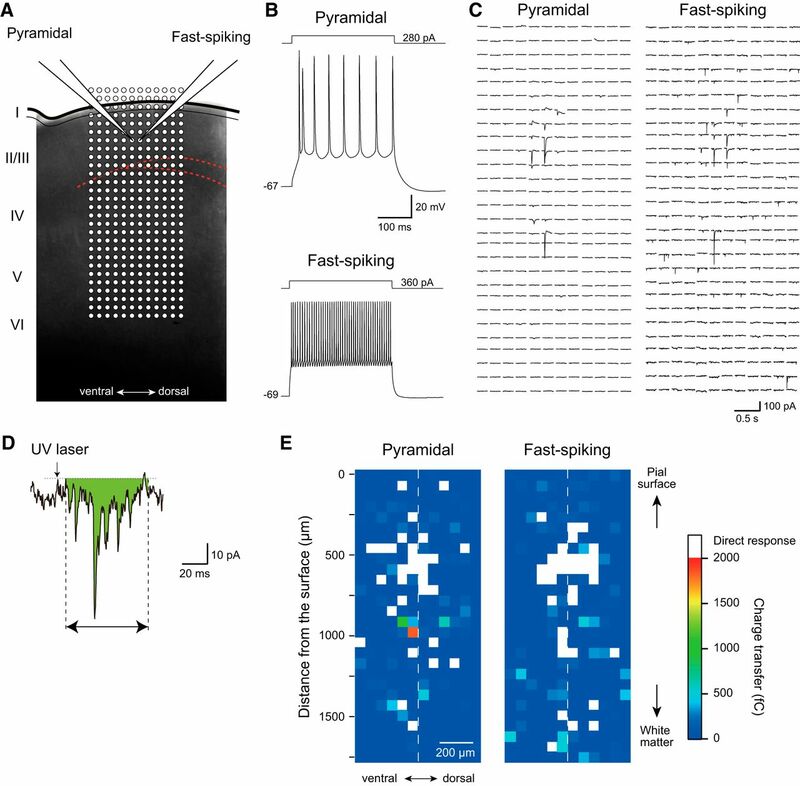 B, Repetitive firing properties of recorded pyramidal and fast-spiking neurons. C, LSPS-induced currents recorded from pyramidal (left) and fast-spiking neurons (right) shown in A, B. Evoked currents are arranged in the same sequence shown in A. D, A representative transsynaptic current evoked by laser photostimulation. Charge transfer from 5 to 70 ms (green area) was quantified to construct the excitation map. E, Excitation maps obtained from pyramidal and fast-spiking neurons shown in A–C. Direct responses (white pixels) occurring without latency following LSPS application were not included in the analysis. Averaged LSPS-induced excitation maps obtained from pyramidal and fast-spiking neurons in Layer II/III IC of sham and 1w-IANX rats. A, Excitation maps obtained from pyramidal neurons in sham (n = 14; left) and 1w-IANX (n = 18; right) rats. The maps were aligned to the reference of the line of the pial surface and vertical axis perpendicular to the pial surface. Recorded pyramidal neurons are located within the white quadrangles. Note that pyramidal neurons receive dense excitatory inputs from deeper layers that correspond to Layer IV and superficial Layer V. B, Averaged charge transfer obtained from area enclosed by red quadrangles shown in A was compared. The charge transfer from pyramidal neurons in the 1w-IANX group was larger than that in the sham group at depths from 500 to 1000 μm from the pial surface. C, Excitation maps obtained from fast-spiking neurons in the sham (n = 19; left) and 1w-IANX (n = 10; right) groups. Recorded fast-spiking neurons are located within the white quadrangles. Note that fast-spiking neurons receive dense excitatory inputs from deeper layers that correspond to Layer IV and superficial Layer V. D, Averaged charge transfer of fast-spiking neurons in the 1w-IANX group is larger than that in the sham group at depths from 500 to 750 μm from the pial surface; *p < 0.05, **p < 0.01, Student’s t test. Representative examples of mIPSCs recorded from Layer II/III pyramidal neurons in the sham and 1w-IANX groups. A, Continuous mIPSC recording in sham rats following the application of 40 μM DNQX, 50 μM D-AP5, and 1 μM TTX. Holding potential was set at +10 mV. B, Continuous mIPSC recording in 1w-IANX rats. C, Comparison of interevent interval and amplitude of mIPSCs between the sham (n = 11) and 1w-IANX (n = 10) groups. Note the significant increase in the interevent interval and decrease in amplitude in the 1w-IANX group; *p < 0.05, Student’s t test for interevent interval and Mann–Whitney U test for amplitude.